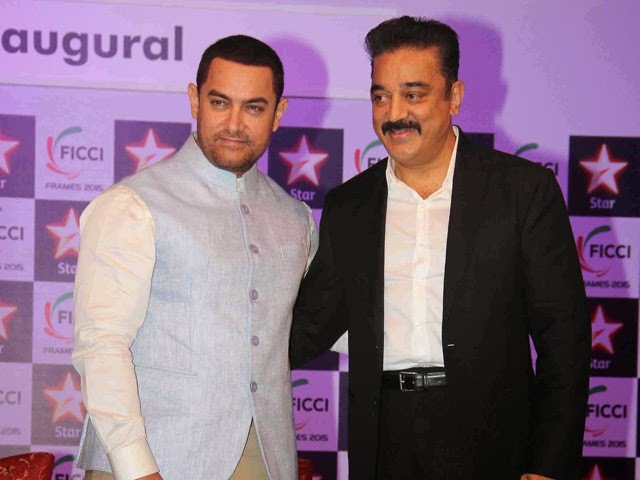 Aamir Khan conveyed his apology to Kamal Haasan publicly at the FICCI Frames 2015, for the hassle Kamal faced during his Vishwaroopam release and not standing for his support at the crucial time. He said, "I take this opportunity to apologize to you, Mr. Kamal Haasan, for not standing by you when your film was banned in 2013. I was lost in my work. But, I want to apologize to you that I wasn't there at that time. I read about it later and felt so bad about it, that you had to go through all that. I think we all filmmakers should stand by each other in such cases and I should have supported you during those trying times." Kamal Haasan admitted Aamir’s apology with a smile in response.